Internships give participants valuable experience and help them make connections with potential employers. The College of Letters and Science allows a maximum of 12 units of internship credit to count toward the 180 unit requirement. Internships provide valuable experience in a particular job and potential employers get to know their employee, thus internships carry their own rewards. Students completing an Internship in Economics (ECN192) will receive upper division credit toward graduation requirements (180 unit requirement) but will not receive credit toward the Economics major. Typically 1-2 units per quarter (on rare occasion up to 4 units) are given for internship credit. There is a 6-unit cap on total credits per student (across all quarters) granted for economics internships. In order to receive academic credit for an internship, the internship needs to be comparable to studying for a course on campus. Only internships with a clear research component qualify for lower division academic credit. For details about types of work that qualifies for ECN192 credit, please review the unit rubric. Interested students should go to the Internship and Career Center (South Hall) for assistance in obtaining an internship. Academic credit can only be given for internships at institutions and companies outside campus. If internship credit was approved, at the end of the quarter (by the third day of finals week) you will need to submit a typewritten (double-spaced) report outlining your experience to the faculty member in charge (see below). The emphasis must be on the research aspects of your internship. Credit will then be granted only if there is convincing evidence in your report that you did spend a non-negligible amount of time on activities comparable to taking a course on campus. The length of the report is determined by the number units approved for your internship. 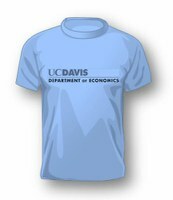 Students interested in Economics internship credit will be working with the Economics Internship Advisor, Derek Stimel.